OptiPlex 5040 Mini Tower. More space & performance. Small, space-saving desktop that delivers all-around performance. With dual orientation and support for triple displays. Get Quarterly Business Savings - Take $657 Off the New OptiPlex 5040 PC, Now Only $1129. Featuring a 6th gen Intel Core i7 processor, 8GB memory, 500GB Hard Drive, Windows 7 (Incl. Windows 10 Pro License). OptiPlex 5040 Small Form Factor. More space & performance. Small, space-saving desktop that delivers all-around performance. With dual orientation and support for triple displays. Get Quarterly Business Savings. Take $547 Off the NEW OptiPlex5040 PC, Only $929. Featuring a 6th gen Intel Core i5 processor, 8GB memory, 500GB Hard Drive, Windows 7 (Incl. Windows 10 Pro License). OptiPlex 3040 Micro. Small, secure and simply managed. Ultracompact, energy efficient desktop with versatile deployment and custom mounting options. Get Quarterly Business Savings. Take $437 Off the NEW OptiPlex3040 PC, Only $829. Featuring a 6th gen Intel Core i5 processor, 4GB memory, 500GB Hard Drive, Windows 7 (Incl. Windows 10 Pro License). Take 337$ Off For NEW OptiPlex 3040 PC!! OptiPlex 3040 Micro. Small, secure and simply managed. Ultracompact, energy efficient desktop with versatile deployment and custom mounting options. Get Quarterly Business Savings. Take $337 Off the NEW OptiPlex 3040 PC, Only $729. Featuring a 6th gen Intel Core i3 processor, 4GB memory, 500GB Hard Drive, Windows 7 (Incl. Windows 10 Pro License). Where work happens. 14" business laptop with the world�s best security. Featuring an optional QHD screen with E2E touch display, plus purpose-built mobile accessories. Get Quarterly Business Savings - Take $1140 Off the Loaded Latitude E7470 Laptop Only $1949. Featuring a 6th gen Intel Core i5 processor, 8GB memory, 256SSD, Windows 7 (Incl. Windows 10 Pro License). Customizable: Includes a 5th Gen Intel� Core� i5-5200 processor. Available features include more memory, a larger hard drive, optional touch screen display, better graphics card and your choice of Windows Professional operating system. Get Quarterly Business Savings Take $469 Off the Latitude 3460 Laptop Only $849. Featuring a 5th gen Intel Core i5 processor, 4GB memory, 500GB hard drive, Windows 7 (Incl. Windows 10 Pro License). Save 579$ Off Latitude 3570 Laptop! Performance you can rely on. The essential business-class features and options that deliver the performance small and growing businesses need. NEW! With a Nvidia GeForce Video Card. Save $579 Off the Latitude 3570 Laptop Only $1069. With a 6th gen Intel Core i7 processor, 4GB memory, 500GB hard drive, Windows 7 (Incl. Windows 10 Pro). Built for work. Designed to impress. Our most secure 15" mainstream business laptop is now thinner, lighter and beautifully designed, so you can work confidently. NEW! Featuring a 6th Gen Intel Core i5 - Save $599 Off the Latitude E5570 Laptop, Only $1,049, with 4GB memory, 500GB hard drive, Windows 7 (Incl. Windows 10 Pro License), 1 year next business day. Save 1477$ Off on PowerEdge R330 Rack Server! PowerEdge R330 Rack Server. Powerful, versatile, expandable. Intel� Xeon E3-1240, 8GB memory, 500GB 10K SAS hard drive, and 3 year basic warranty. Get Quarterly Business Sale - Save $1477 Off on PowerEdge R330 Rack Server, Only $1889. Featuring an Intel Xeon E3-1240 processor and 8GB memory. Save 647$ Off on PowerEdge T130 Server! PowerEdge T130 Tower Server. Powerful, compact, agile. Intel� Xeon E3-1200, 4GB memory, 1TB hard drive, and 1 year basic warranty. Get Quarterly Business Sale - Save $647 Off on the PowerEdge T130 Server Now Only $949. Featuring an Intel Xeon E3-1200 processor and 4GB memory. Save 100$ on Select Dell Canada Desktop and Laptop Systems! Save $100 Off on Select Dell Canada Desktop and Laptop Systems when you spend over $899 with coupon code ZH2QTBV6ZCC5$B at checkout. Save 50$ on Select Dell Canada Desktop and Laptop Systems! Save $50 Off on Select Dell Canada Desktop and Laptop Systems - When you spend under $899 with coupon code: J2QDBJ?8Q8678W at checkout. Take up to 44% Off Select PCs & Accessories. Plus Servers! Take up to 44% Off Select PCs & Accessories. Plus Servers! Shop Now. Hot Business Deals on Electronics & Accessories. Hot Business Deals on Electronics & Accessories. Shop Now. Weekly Friday to Thursday. Offer End Date: 10/15/2015 11:59PM. No Code Needed. Save 100$ Off on Select Dell Canada Desktop and Laptop Systems. 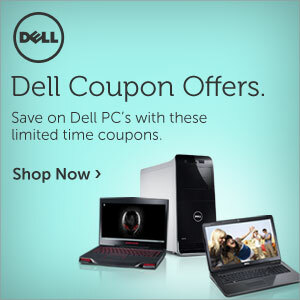 Save $100 Off on Select Dell Canada Desktop and Laptop Systems when you spend over $899 with coupon code X$B00ZC?8ZDT3B. Offer Expires October 30th, 2015. Shop Now. Save 50$ Off on Select Dell Canada Desktop and Laptop Systems. Save $50 Off on Select Dell Canada Desktop and Laptop Systems when you spend under $899 with coupon code F2ZTVC1CG7CSBP. Offer Expires October 30th, 2015. Buy Now. 72 Hour Sale - Up to 50% Off Business PCs and More. 72 Hour Sale - Save Up to 50% Off on Business PCs and More. Shop Now. Offers expire October 15, 2015. No Coupon Required. Hot Business Deals on Electronics and Accessories. Hot Business Deals on Electronics and Accessories. Shop Now. Weekly Friday to Thursday. No Code Needed. Save $100 Off on Select Dell Canada Desktop and Laptop Systems when you spend over $899 with coupon code X$B00ZC?8ZDT3B at checkout. Expires October 30th, 2015. Shop Now. Save $50 Off on Select Dell Canada Desktop and Laptop Systems when you spend under $899 with coupon code F2ZTVC1CG7CSBP at checkout. Expires October 30th, 2015. Shop Now. Hurry! Save up to 50% Off on Select PCs and Electronics. 4 Day Sale for Business. Hurry! Save up to 50% Off on Select PCs and Electronics. Shop Now. Offers Expire October 1, 2015. No Coupon Needed. Save Hot Business Deals on Electronics & Accessories. Save Hot Business Deals on Electronics and Accessories. Shop Now. Weekly Friday to Thursday. No Code Needed. Save $100 Off on Select Dell Canada Desktop and Laptop Systems when you spend over $899 with coupon code X$B00ZC?8ZDT3B at checkout. Offer Expires August 28th, 2015. So Shop Now. Save $50 Off on Select Dell Canada Desktop and Laptop Systems when you spend under $899 with coupon code F2ZTVC1CG7CSBP at checkout. Offer Expires August 28th, 2015. So Shop Now. OptiPlex 3020 SFF For Just $649. With 5th Gen Intel� Core i5-4590 processor, 4GB RAM, 500GB, Windows 7 Professional, 3 Year Next Business Day. Use Coupon Code: Save50SB3 at checkout. Vostro 14 3000 Laptop For $829 with 5th Gen Intel� Core i5-5200 Processor. Styled for Work. Styled for You. Vostro 14 3000 Laptop For Just $829 with a 5th Gen Intel� Core i5-5200 processor, 8GB RAM, 500GB Hard Drive, Windows 7 Professional, 1 Year Next Business Day. Use Coupon Code: Save50SB3 at checkout. Vostro 15 3000 Series Laptop. Meet the laptop devoted to small business. Vostro 15 3000 Series is designed to keep your workday running smoothly. So buy this Vostro 15 3000 Laptop for Just $499 after coupon, with a 3rd Gen Intel� Core i3-4005 processor, 4GB RAM, 500GB Hard Drive, Windows 8, 1 Year Next Business Day. Use Coupon Code: Save50SB3 during checkout. Save $50 Off on Select Dell Canada Desktop and Laptop Systems when you spend under $899 with coupon code HZ2LW410GJCXD0 at checkout. Shop Now. Save $100 Off on Select Dell Canada Desktop and Laptop Systems when you spend over $899 with coupon code NRLP32Z9F62WW7 at checkout. Shop Now. Canada Day Sale! Get up to 50% Off Select PCs And Electronics. Canada Day Sale! Get up to 50% Off Select PCs And Electronics. Featuring the new Vostro 15 3000 laptop at $499. Offers expire July 5th. Shop Now. Save $100 Off on Select Dell Canada Desktop and Laptop Systems when you spend over $899 with coupon code $PVRSFWR0ZQF0C. Expires June 25th, 2015. Shop Now. Save $50 Off on Select Dell Canada Desktop and Laptop Systems. When you spend under $899 with coupon code MDLQXG65LGJPCN. Expires June 25th, 2015. Shop Now. Summer Sales Event - Get Up To 50% Off on Select PC's & Electronics. Equip your office for less with the Summer Sales Event - Get Up To 50% Off on Select PC's & Electronics. Shop Now. No Code Required. Hot Business Deals on Electronics and Accessories.� Shop Now. Save $100 Off on Select Dell Canada Desktop and Laptop Systems when you spend over $899 with coupon code $PVRSFWR0ZQF0C. Expires June 25th, 2015. Save $50 Off on Select Dell Canada Desktop and Laptop Systems when you spend under $899 with coupon code MDLQXG65LGJPCN. Expires June 25th, 2015. Vostro 15 3000 Laptop For $779. Vostro 15 3000 laptop with a 5th Gen Intel� Core� i5-5200 processor, 8GB RAM, 500GB Hard Drive, Windows 7 Professional (includes Windows 8.1 Professional� License), 1 Year Next Business Day. So buy this Vostro 15 3000 Laptop For $779. Vostro 14 3000 Laptop For $599. Vostro 14 3000 laptop with a 5th Gen Intel� Core� i5-5200 processor, 4GB RAM, 500GB Hard Drive, Windows 8, 1 Year Next Business Day. So buy this Vostro 14 3000 Laptop For $599. Vostro 15 3000 Laptop For $579. Vostro 15 3000 Laptop with a 3rd Gen Intel� Core� i3-4005 processor, 8GB RAM, 500GB Hard Drive, Windows 8, 1 Year Next Business Day. So buy Vostro 15 3000 Laptop For $579. Vostro 14 3000 Laptop For $499. Vostro 14 3000 Laptop For $499 with a 3rd Gen Intel� Core� i3-4005 processor, 4GB RAM, 500GB Hard Drive, Windows 8, 1 Year Next Business Day. So Buy Now. Now is a great time to get active as a DELL.ca Home and Small Business Affiliate! Your customers will enjoy Dell.ca�s wide array of desktops, laptops, monitors, printers, TVs, cell phones, and other popular consumer electronics and accessories.